Our range of bushings and sleeves for front loader and backhoe assists in locating bolts and provide additional strength to the assembly. Easy to install, these protective bushing and sleeves have a high wear resistance that makes it highly durable. Our range of bushing and sleeves can be designed and developed in different dimensions as per specifications or drawings provided by the clients. We manufacture bushes upto 400mm diameter in all types of thermoplastic materials. Colour and surface finish can be varied depending on end requirement and customer preferences. ISO 9001:2008 & ISO/TS 16949:2009 certified custom manufacturer of bushings including sleeve bushings. 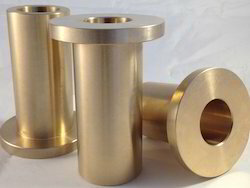 Material : Brass, Bronze, Copper Alloys, Stainless Steel & Carbon Steel. T type \ Nozzle bushes. Fittings on the vessel of nozzles bushes\sleeves are done as per request. Specilised die to save the material and thus also saves price. 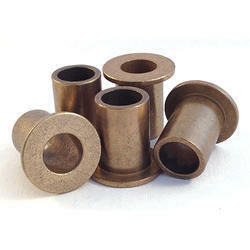 We are a leading manufacturer & supplier of Sleeve Bushings. These bushings are made up of superior quality raw material and are known for their durability. These are used to securely mount the product onto a shaft. Sleeve Bush manufactured by us is forged using premium quality high grade material and most advanced processing techniques. These sleeves are used for diverse mechanical engineering applications. We make available sleeves at reasonable market price. - Grundfos type Bearing Bushes and Sleeves. - Luby type Bearing Bushes and Sleeves. - Texmo type Bearing Bushes and Sleeves. We provide bushes and sleeves, serving various industrial and commercial requirements. These sleeves and bushes are also widely demanded in the national and international markets. We are offering Cylindrical Bushing Sleeve to our clients.